The Gold American Eagle is one of the most popular gold bullion products in the world. Bearing some of the most powerful symbols of American power and freedom, the Gold American Eagle coin includes images of Lady Liberty and the bald eagle. Today, you can purchase a 2014 1/10 oz Gold American Eagle with an MS70 grade from the Numismatic Guaranty Corporation. These coins came from US Mint Box #1, meaning they were chosen from the very first mint-sealed box of 1/10 oz Gold American Eagles in 2014. Lady Liberty and the bald eagle stand for freedom and power in American culture. The Statue of Liberty has stood in New York Harbor for 130 years, serving as a welcoming face for millions of immigrants seeking a better life in America. The bald eagle, chosen as the national emblem over two centuries ago, is respected for its power, majesty, and longevity. Gold American Eagles were first produced in 1986 following the passage of the Gold Bullion Coin Act of 1985. Congress authorized the program and established the Gold Eagle as the official gold bullion coin of the United States. On the obverse side of the 2014 1/10 oz Gold American Eagle is Augustus Saint-Gaudens’ image of Lady Liberty. She is featured in a full-length figure, walking toward the viewer with a torch in her right hand and an olive branch in her left. Engravings include “Liberty,” the year of minting, and stars around the rim representing all US states. The US Capitol Building is visible in the left background. 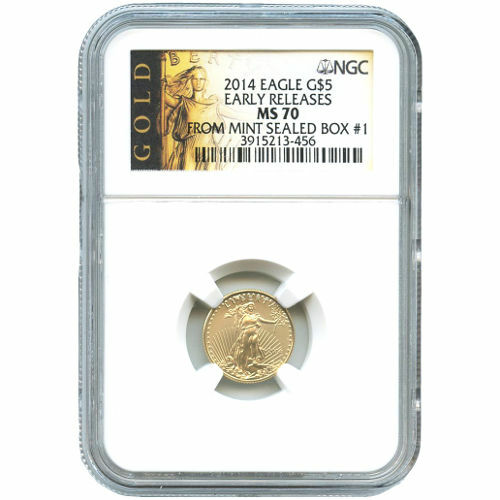 The front of the NGC label reads “2014 Eagle G$5” followed by “Early Release,” “MS70,” and “From Mint Sealed Box #1.” Below this information is the coin’s unique certification number which can be verified through the NGC. 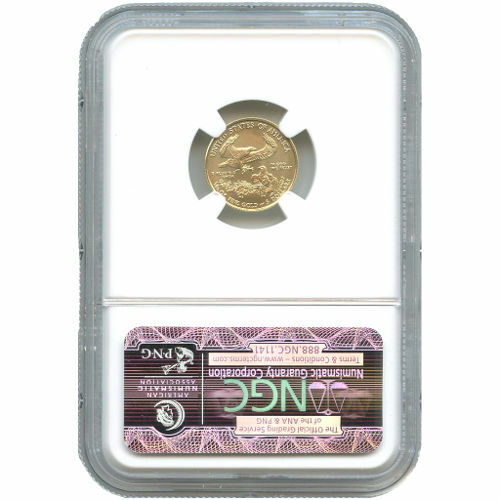 If you have questions about this 2014 1/10 oz Gold American Eagle NGC MS70 from US Mint Box #1, don’t hesitate to contact our associates at 888-989-7223. You can also reach us online using our website’s live web chat feature.